I stayed at my sisters last Saturday and she wanted to cook a dish that my Mother used to make us when we were children. I know other people that can cook wax lyrical about their Mothers cooking, but our Mother was not a wonderful cook. She didn’t spend hours in the kitchen nor did she deviate from the same local shops each week. As a full time teacher with 4 children of her own, her educational hopes for us did not necessarily include culinary glory. Instead, our afternoons and weekends were spent at music lessons, and girl guides where the cooks badge gave us enough of a spin in the kitchen to grow fond of it. There seemed to be very little time for cooking in my mothers world and one of her high rotation meals after “stew” made in the pressure cooker was Curried Sausages. The sausages at the time were probably quite good as this was a time when there were few ready made fillers and bags of flavouring and preservatives. Her curry was more influenced by the British India’s than anything from Thailand or the actual Indian continent. It included sultanas and apples. 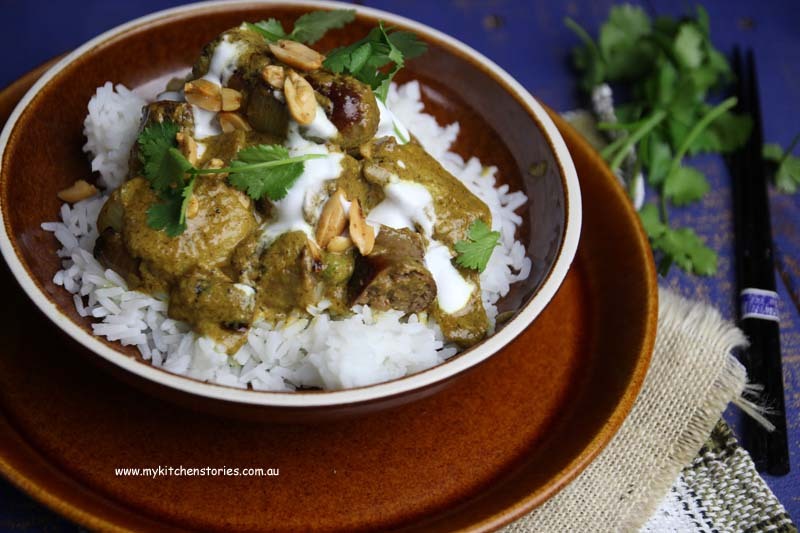 My sister and I threw together a nice curry made with what ever she had in the cupboard and our childhood ingredient Keens curry, a sort of British curry powder with a foot in a few country camps. Last week I was introduced to Beak and Sons Sausages, their classic beef sausages are a gluten and additive free, 92% beef sourced from The Hunter Valley. David Beak comes from a long line of butchers and is admirably passionate about his work with the humble sausage. It’s great to meet an Australian producer and business owner. 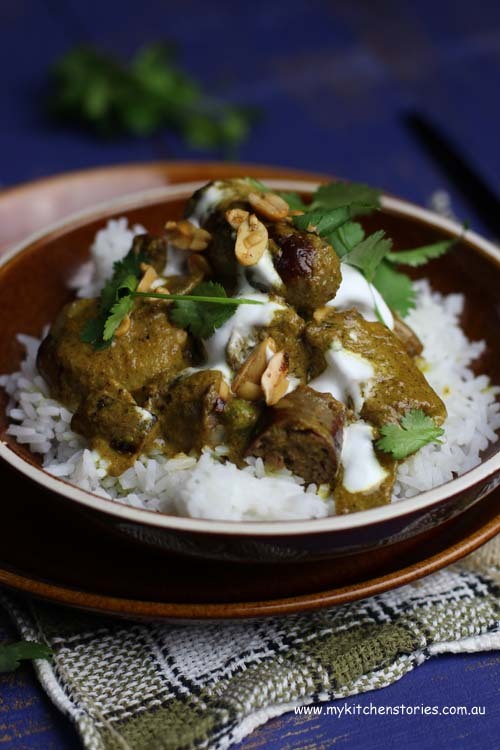 The recipe has been carefully devised for texture and moisture and no added nasties is an attractive prospect for a quick meal, so I decided to make a curry with them. Not Mum’s style curry but my modern twist on Mum’s dodgy recipe. 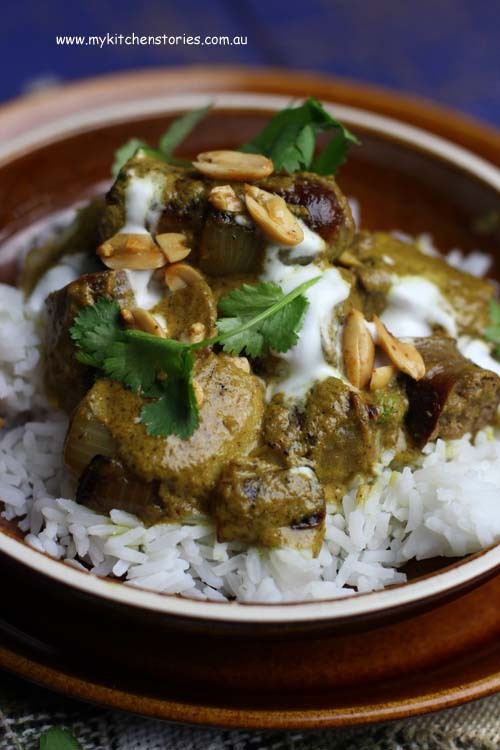 Massaman is a beautiful Thai curry based on pepper, peanuts and coconut cream. It is often made with beef or lamb so these sausages fit the bill perfectly. I made it with spices that are probably in your cupboard right now. 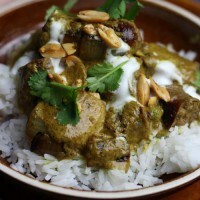 Massaman is a complex curry but this is the quick and very tasty version that is better than a bought paste. Don’t however let me discourage you from using a store bought paste if you like. Who am I to judge? It should take you around 30 very Jamie Oliver minutes of multitasking. Clean and peel the potatoes cut and steam or boil till just tender, set aside. Put the onion, garlic, ginger, coriander stalks and roots, zest, peanuts, 125 ml coconut and oil into a blender or hand mixer. Blitz till pureed well. Add this puree to the spices in the pan and turn back on the heat . Stir on medium till the paste darkens and smells fragrant. It will start to split a bit. Keep stirring for about 8-10 minutes. Add the stock and 250 ml coconut and stir well. Add fish sauce , lime juice and 1/2 the salt . Let the sauce simmer for 10 minutes . Taste again and add more salt if needed. Add the potatoes & peas to the curry sauce and the chopped cooked sausages. Simmer again for 10 minutes before serving with rice and roasted peanuts. 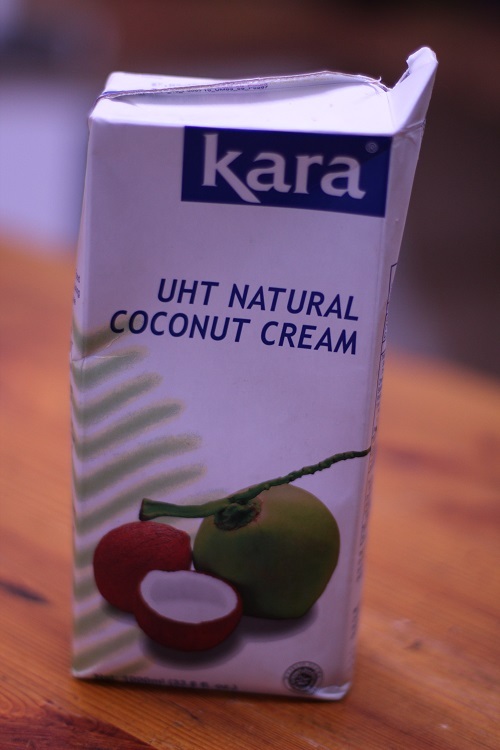 Do try to find Kara Coconut cream it will make all the difference. My Kitchen Stories was given a pack of Beak & Sons Sausages to try. As always all opinions are my own. I’m a visual eater and unless the sausages are cut up in the curry sauce, I roll my eyes and think, “seriously? ?” LOL Don’t judge me. This curry does sound full of flavour – and memories. Curry with apples and sultanas and a side serve of sliced bananas was a childhood staple too and I still serve up sliced bananas even now. Does that make me retro or dodgy? Your curry looks much posher than mine normally do. Oh bec, that was the exact way we had our curry too. I had forgotten about the boi;ing thing! Isn’t that funny about your mum and then you turned out to be such a great cook! I’ve heard a few chefs say something like that. Shall definitely try your way of making Massaman curry, even tho’ it may not be with sausages unless I can source ones with 90 + % lean meat in them 🙂 ! And let us not go back to dear Mum – I remember only too clearly being a young bride with a curry hungry husband and making very unsatisfactory offerings with Keen’s curry powder – and, yes, raisins and bananas figured too, even peanuts methinks!!!!!!! Thank God some cookery class or other taught me to use a mortar and pestle!!! Agreed. UHT coconut cream has such a different taste to the tinned versions. Just made this for dinner but added baby carrots and used vegetable broth- A+++++ such a good recipie! It’s in the cycle now.